The CEO of the Reform Movement in Israel, Gilad Kariv, is demanding that the state revoke the operating license of cable’s Channel 20, “because it denies sufficient access to the Reform movement in Israel,” which, he claims, is a significant Jewish denomination among Israelis. Israel’s Channel 20, the “Heritage channel,” has been under attack from several directions since its launch, back in 2014, mostly for attempting to report the news from a rightwing, Jewish perspective, or, as the Council for Cable and Satellite Broadcasting puts it — for reporting the news, period. They have already been fined heavily twice, $25,000 for broadcasting from an election campaign rally, and $38,000 for broadcasting news briefs. But not only the CCSB wants the channel to stop running news stories — the competition, the three existing news channels, are concerned about losing their viewers who might flock to a rightwing news channel like CNN viewers to Fox. Kariv’s attack comes from a new direction, and has to do with Channel 20’s traditional definition of who is Jewish and therefore may be invited to become part of the “Heritage.” Kariv posted on his Facebook page that “It is an honor to join President Rivlin in the line of fire against Channel 20, whose miniscule ratings are driving its owners crazy.” He called the Channel’s content “pseudo-Zionist” and accused them of promoting nationalism as love of motherland. 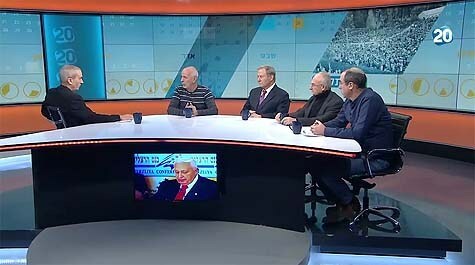 Back in December, Channel 20 posted a vehement attack on President Reuven Rivlin for appearing at a forum organized by Ha’aretz which also hosted representatives of Breaking the Silence. Since then, at least one key participant in the channel — CEO Moti Sklar — has left in protest of the channel’s harsh tone. The commonly used figure for how many Israelis see themselves as Reform or Conservative is 7%, split evenly between the two denominations. The problem with this figure is that its source is a 2013 survey published by a Reform movement-financed organization, Israeli Democracy Institute (IDI). The IDI admits that the number of people asked in the survey was exceptionally small for such a crucial subject matter — a mere 854. It is also extremely unreliable for the fact that it states that some respondents said they are both Reform and Conservative.